7 Dominicans walk from DR Capital Santo Domingo all the way to Champs-de-Mars, Port-au-Prince Haiti, in a peaceful march against ruling 168-13, the judgment of the Constitutional Court of Dominican Republic denying citizenship to Dominicans of Haitian descent. 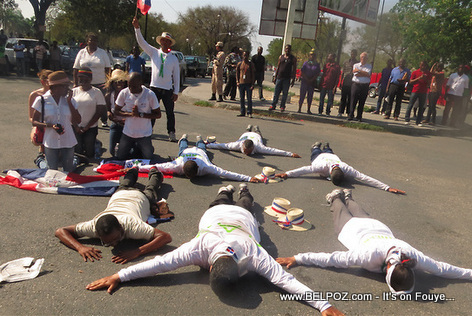 These seven Dominicans,Hector Joaquin, Rafael Guillen Beltre, Julio Ernesto, Altagracia Leidy, Julio Melvyn, Bonny Guillen Beltre et Carvasta Felipe, Representing an organization called Paz Dominicana, arrived at la place de la Constitution in Champs-de-Mars, Port-au-Prince Haiti, on foot, Sunday, 9 Mar 2014, after walking 400 kilometers from Independence Park (Parque Independencia, Santo Domingo / Dominican Republic), a peaceful march which began on Tuesday 25 Feb 2014. There are a lot of good people in this world. These 7 Dominicans did it for a good cause. I do have a lot of respects for them. They believe in peace and harmony. Parfait, cette marche me faire rappeler les marches de Goman de la Grand'Anse au Cap lors de la lutte pour l'indépendance. Et pourtant les hommes disent la terre est à eux or à l'Eternel la terre et ce qu'elle renferme. The 168-13 ruling is not a mistake. The Dominican Republic does not grant citizenship to all those born within its jurisdiction. You want to take revenge on those 7 Dominicans that are walking to Port-Au-Prince to beg for forgiveness? 1. Haiti keep dumping poor immigrants on the Dominican Republic and feels entitled to do so. listen when the DR government made that mistake I was more upset than anybody else, now we needs to show the Domican government, not the dominican people's that we are not the same with them. those who asked for revenge, I think you need to go back to history read about Martin Luther King, Nelson Mandela, Malcolm X. you can't fight darkness in the dark, u needs to put light, you can't fight violence by being violent so please haitian people's show the world what they think about us is not true they wrong, dead wrong.